There are a few events that stand out clearly in my mind’s eye that sum up my introduction and experience with music in The Jewel. The first one is definitely 1960 Christmas, when as a boy of ten years, I was given my first guitar by my mother, Lydia Ramirez. My mom was a De La Fuente from Macaw Bank, Cayo District. Like her dad and siblings, she played the guitar and she also had a beautiful voice. That guitar (not a professional one) was bought from “Rita’s Smart Shoppe,” which was at the corner of Albert Street and Church Street and run by the two sisters, Sybil Codd and Leonie Wright. Miss Sybil was the mother of the late Francis Codd. My guitar lessons started that Christmas Day in 1960. The second event would be when we got our first record player. My dad, Jose J. Ramirez, better known as Jose Ramirez or “Boss Joe,” had travelled to Florida in 1962 for a serious surgery which turned out successfully. On his return, he brought a portable General Electric record player. While my dad was in Florida, he was introduced by his brother, Luis Ramirez, to a movement started by a man named Ernest Holmes. This movement had to do with “The Power of Positive Thinking.” His first lessons were on long playing records and since we didn’t have a record player, he brought one. We boys certainly didn’t listen to those records, but we started to collect the music of the day! Our first records included, The Beatles, Pat Boone, The Four Aces…A few months down the line, Lord Rhaburn brought Tropico y Ritmo to town and we gave that record hell! The third event would be that of my mom buying from the Vogue’s, at the foot of the Swing Bridge, around 1965, a portable reel-to-reel tape recorder. My mom was doing two programs at Radio Belize, Rincon Infantil (Children’s Corner) and Amas de Casa (The Housewives) for the Spanish-speaking audience with her voice and her guitar. Because she wanted to record her programs and guitar playing for posterity, after saving her small pay vouchers she received from Radio Belize, she bought the recorder. We boys referred to those years as the reel-to-reel years!! We recorded everything under the sun! We imitated the radio commercials, we had mock debates, we did the news local and international, we imitated the great Seferino Coleman, George McKesey, Bob Reneau and others. We recorded our early years learning to play the guitar and, most of all, we recorded the music of the day! My youngest brother Gustavo, who resides in Washington State, is the one who saved these tapes and even to this day, when I remember a certain recording, I would call him and he would locate the recording and he would transfer it to cassette and send it for me. The final event would be me and my brother Richard forming the band Los Echos in 1969. We had heard that the Messengers Band had broken up and that the instruments which belonged to Ricardo Castillo, better known as Ricks, were lying around at one of his joints on the Western Road known as Las Vegas. Because Ricks was a close friend to my dad, we went to see him at his business on Queen Street in front of the Police Station. I remember Ricks was high, and after talking to us mostly about his experience with our dad, he agreed to lend us the instruments. These included the drum set, which was a Ludwig, the two guitars, rhythm and bass, and the speakers, which were Fender. I think the agreement was for us to play at one of his joints. At this time it was said that Ricks had seventeen bars! Los Echos exploded on the scene, but lasted little over a year. I guess we were too young with little discipline and were lacking a strong leader. In 1969 we won second place in the Battle of the Bands. First place was won by Los Atlanticos from Cayo. The Mambi boys from Douglas O.W. came in third. At this time, music from Los Aragon, Los Dinners and Los Platinos was popular in the city and was replacing Billy Vaughn’s La Paloma, Herb Alpert’s The Lonely Bull, etc. (My brother Richard, aka Charro, was introducing me to Sam Cooke and Otis Redding.) Two of the pieces we played in the battle of the bands were Yo, tu y las rosas and San Martin from Los Aragon. We also played The Breeze and I. 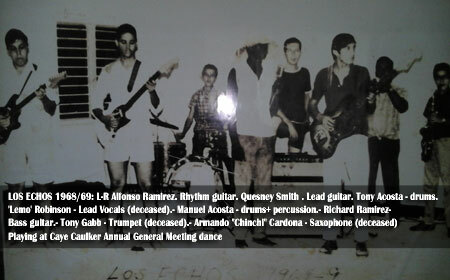 When the band Los Echos folded, most of the players went to the Professionals. The late Bill Belisle of Messengers fame once played with Los Platinos. I am told that Los Platinos came to Belize, discovered Bill and took him back to Mexico with the band. Jesus Acosta of Los Beliceños fame also played with Los Dinners. Lucio Alcoser of the New Generation Band played with Benny y su Grupo; these bands were from Merida and Chetumal.